In our communities, we raise awareness of key issues by hosting events with an emphasis on bringing speakers from the Bahraini-American community and from Bahrain to the US to meet with lawmakers, US government officials, and other non-profit organizations. In the non-profit sector, we work closely with other leading human rights organizations in the US, Bahrain, and Europe to strengthen advocacy efforts. In Congress and the executive branch, we develop relationships with key legislative representatives and government officials to create sustainable improvements in US foreign policy that support and strengthen human rights in Bahrain. Internationally,we work with activists and non-governmental organizations to raise awareness of the human rights situation in Bahrain among UN officials, state representatives to the UN, and European parliament leaders. In the media, we work to increase awareness of the human rights situation in Bahrain by promoting and distributing news and information regarding events taking place within Bahrain, and by serving as a source of expertise in interviews and in written publications. 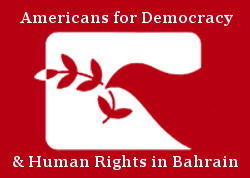 In Bahrain, we support the work of leaders in the democracy and human rights movement by facilitating connections between them and US policymakers, other government officials, and leading non-profit organizations in the US. ADHRB was initially formed in 2002 through the culmination of a series of six conferences that helped to unite the Bahraini-American community in the United States. ADHRB was formally incorporated as a non-profit organization in 2008, and received its IRS tax-exempt status in 2009. ADHRB is a member of the CIVICUS World Alliance for Citizen Participation and IFEX Global Network for Defending and Promoting Free Expression. We are an accredited non-governmental organization in special consultative status with the United Nations Economic and Social Council (UN-ECOSOC). Our work is made possible through generous individual donations and the support of international institutions and NGO partners. ADHRB does not accept government funding.